On November 10, the Center for Innovation and Entrepreneurship hosted its first regional qualifier pitch competition for the International Business Model Competition (IBMC). The competition hosted students from the University of Mississippi, Tulane, and John Brown University as they competed for $2,000 and a place to compete at the International Business Model Competition in Provo, Utah at Brigham Young University in 2018. The eight student teams who participated took varying paths in order for a chance to compete the Oxford Regional IBMC. The four student teams from the University of Mississippi that pitched in the regional, participated in two other rounds of judging and workshops and beat 20 other teams. The three teams from John Brown University, and the one team from Tulane University each submitted video presentations of their business ideas that followed the LEAN Canvas format. The eight teams took 10 minutes and pitched their ideas to a panel of judges. Two winners were selected- an overall winner that would receive the $2,000 and the spot in the IBMC, and the Oxford winner that would act as the runner-up and receive a new Apple Watch. The ov erall winner of the competition was Anna Gibson from John Brown University for her bus ride sharing idea, UniRider. 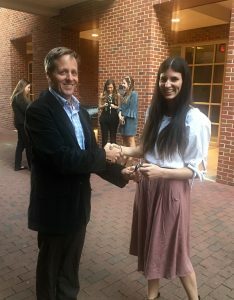 Bella Gonzalez, a senior art and business major from Bay St. Louis, won the Oxford prize and the runner-up position for her innovative stationery and planner company La La Letter.